Adorable young couple walking barefoot on the windy beach full of stones. Barefoot young couple walking on the beautiful stony beach. 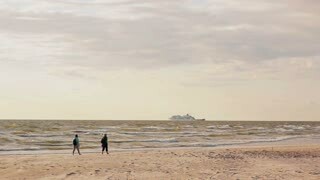 A woman with long dark hair is walking barefoot on a sandy beach towards the waves. 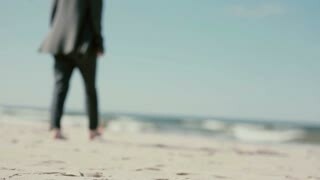 A pregnant woman is walking barefoot on a sandy beach slowly approaching the camera. Legs of woman walking, beach. Barefoot lady near water.